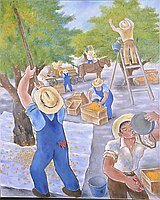 Japanese laborers working on apricot farm. Right foreground, a man in white shirt, brown pants, and hat drinks from a canteen, water dribbling down his chin. A crate of apricots and an empty bucket stand next to him. A man dressed in blue overalls and hat with his back to the viewer pulls apricots down from a tree using a fruit picker onto a cloth spread on the ground. Midground center, a man empties a bucket of apricots into a crate. Empty crates lie nearby. Behind him to the right, a man in brown stands on a ladder hand picking apricots, bucket hanging from the ladder. Further back in the orchard two men load a horse drawn cart with filled apricot crates. Another man carries a ladder toward another tree. Written on back: Japanese Immigration History Series / "Working on Farm"